Zed Zane is your average guy going nowhere. He has a degree in philosophy and works at the local coffee house. He cannot even make rent. On a trip to ask his folks for a loan, he finds a grizzly scene. His stepdad has murdered his mother and attacks him. Zed manages to kill him, but not before he is bitten. Zed knows nothing about zombies and the pandemic spreading across that globe. All of that is about to change. He is infected. Yet, he is not changing, at least not quickly. He is what some call a slow burn and may actually be immune. There are more like him, but not many. Zed’s in trouble. To the zombies he is food and to the uninfected, he is a zombie. He just needs to lay low and survive, but that is easier said than done. Slow Burn: Zero Day, Book 1, by Bobby Adair, is the first novel in Slow Burn series. Currently, there are five novels in the epic story which follows Zed Zane and his new life in the apocalypse. Like many modern zombie stories, emphasis is on adventure more than horror. However, this is not necessarily a bad thing. Bobby Adair crafts an imaginative and easy to read romp through the zombie apocalypse. Zed Zane is your every man. He has no skills or knowledge appropriate for living through the end of the world. Yet, fate is on his side. His slow burn offers him some immunity from detection among the infected. For the first time, he has a leg up on life and he is going to need it. The pandemic, both the spread and effects of the disease, are handled remarkably well. The pseudo-science utilized in its explanation is both believable and easy to understand. One of the most important things for any horror novel is plausibility and Adair hits the nail on the head. 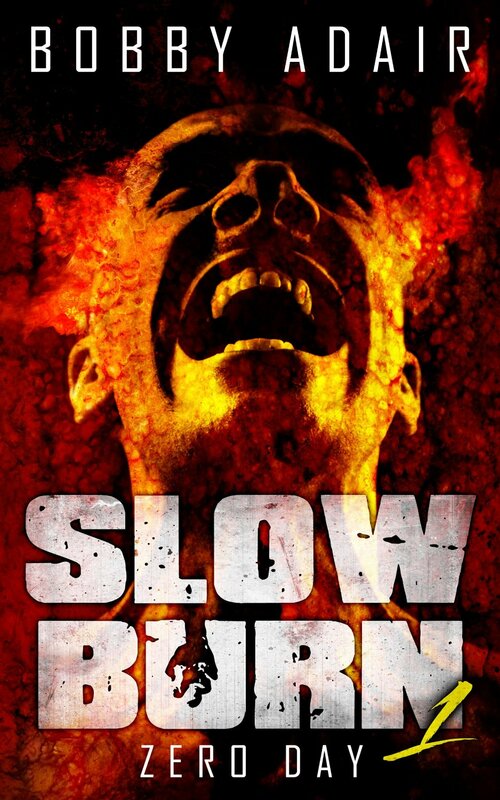 Slow Burn: Zero Day, Book 1 is delivered in an incredibly fast paced manner. Zed is dealing with a situation that is evolving at an alarming rate. The narrative reflects this. Zed bounces from setting to setting and problem to problem quickly. However, it is apparent that Zed’s problems are far from over at the conclusion of the novel. To this end, there are four more books continuing the adventure. This is both a blessing and a curse. Readers can continue to explore the world and follow the adventures of Zed Zane, but are left with an open-ended finale that for many will be both ambiguous and unfulfilling. For those always looking for more zombie, Slow Burn: Zero Day, Book 1, by Bobby Adair, is a good choice. Adair has a written an immersive tale. Prepare to root for the every man. Zed Zane is your quintessential unexpected hero. Yet, unless you plan to read all five books, anticipate dissatisfaction with the ending.